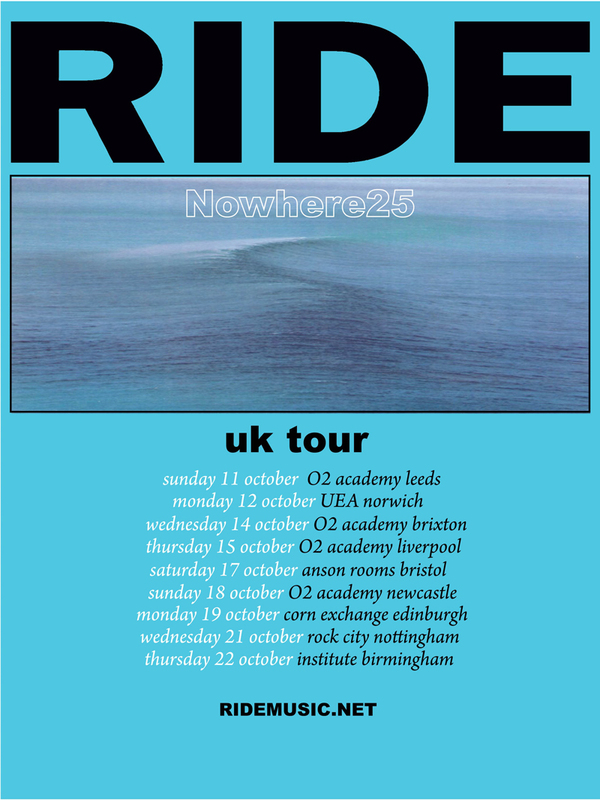 Ride have updated their Facebook page stating they will play the entire Nowhere album as part of their forthcoming UK tour. From Andy on the upcoming RIDE UK tour – “I’m so excited about playing ‘Nowhere’ in full. We are going with the 11 track CD track listing, not just the 8 tracks from the original vinyl, so the set will end with the title track on every gig of the UK tour, which is going to sound epic. I didn’t realise how few times we’d actually played most of the songs. And of course we have never played the album in its original track order before. We have been throwing in versions of some of the songs at our US dates but the majority of the preparation for these shows was done during rehearsals in London in-between our festival shows this summer. I’m especially buzzing about how ‘Kaleidoscope’ is sounding. It’s going to be amazing playing it for the first time. To coincide with the news, another track from the forthcoming live DVD that accompanies the Nowhere 25 re-release has been uploaded to YouTube. Watch the title track from the album performed live at the Town & Country Club on the 7th March 1991 below.